My favourite lip is a bold lip. It looks better in photos, it oozes confidence and it can make you feel like a goddess. So heres how I get it.. I do my whole usual face routine for this video, so I’ve listed all of the products and you can also buy them directly from the images below. But remember, you dont necessarily need these products, just use anything you have similar. I start off with prepping my face with some Optrex eye drops, as my eyes get so tired from the computer 24/7. I add some Eve Lom Serum and some Charlotte Tilbury Magic Cream as it is literally just the most amazing combination for hydrating the skin, before applying a mixture of the Burberry Fresh Glow Foundation in Porcelain and Dior Forever Foundation in 010, as the sheerness and dewyness of the fresh glow mixed with the higher coverage and finish of the Dior Forever is a combo I am loving! I use the Dior Foundation Brush to blend that into the skin, making sure that no brush strokes are visible afterwards. For concealer, I am absolutely in love with the Clarins Instant Concealer in 01 that I blend with the Sigma E40 Blending Brush. I set that with the Hourglass Ambient Lighting Powder in Ethereal. For a more subtle bronze, I use the Body Shop Honeybronzer with Real Techniques Powder Brush. I then began to work into the hollows of my cheeks for more definition with the Charlotte Tilbury Filmstar Bronze and Glow Palette with the Mac Large Contour Brush with the Real Techniques Contour Brush. Benefit Gimme Brow in light/medium, to set the brows and to define any loose hairs. Here I move onto my cheeks, using the Real techniques Buffing Brush to buff in the Clinique Chubby Stick Blush in Amp’d Up Apple, to give the cheeks a subtle pink, peach toned flush. I then take the Urban Decay Naked 3 Palette and the Real Techniques Base Shadow Brush from the Nic’s Picks Collection (I love this set) as well as the Zoeva Luxe Petite Crease brush for the smaller areas such as the inner corners of the eye and the brow bone highlight. I then took the Bourjois Club Contour Eyeliner in Up and Brown on the Zoeva Wing Liner Brush to draw a thin, brown eyeliner to the upper lashes. The eyes were then curled with the Shu Uemura eyelash curlers before a coat of my absolute favourite Clarins Truly Waterproof Mascara. And here is the best part. I lined my lips first with the deep plum of Mac Nightmoth Lipliner before filling in the centre third with Mac Cherry Lip Pencil. 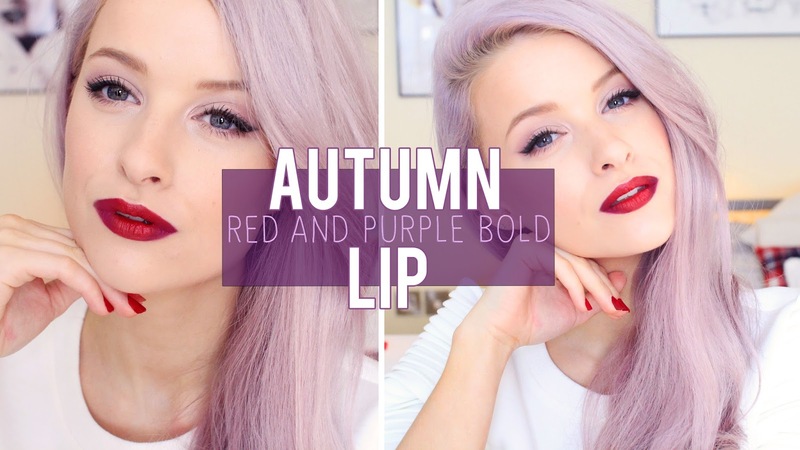 I then go over the outside of the lips, over the nightmoth pencil with the Limecrime Poisonberry Lipstick but any deep purple will do, before filling in the centre of the lips with Mac Russian Red Lipstick. You just need to keep reapplying the red and the purple over each other until you get a seamless ombre from red to purple. What do you think? 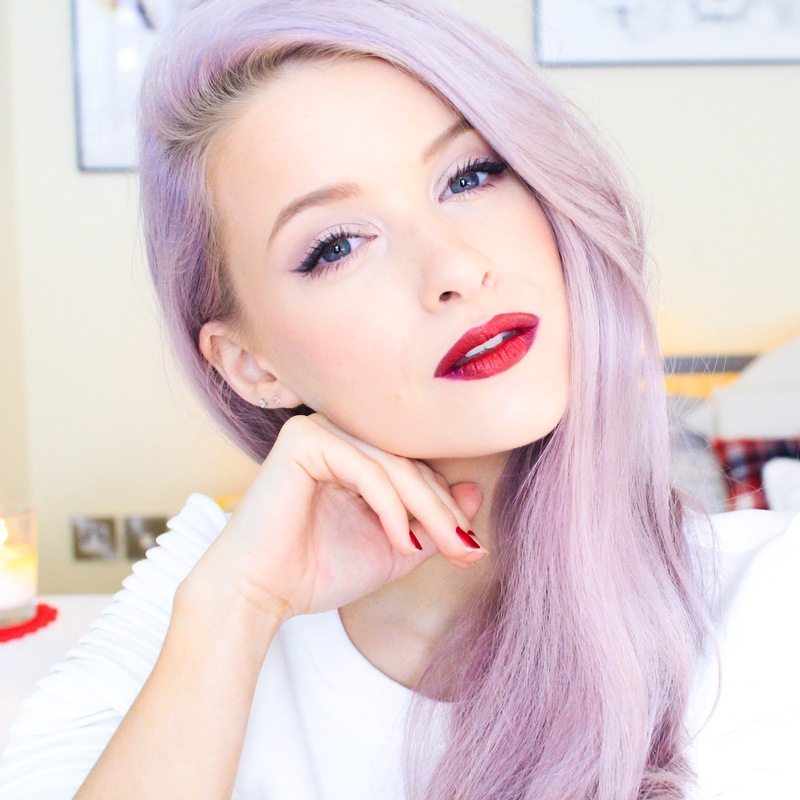 Will you dare to go purple this Autumn/Winter?